Kendall Chapman-Ryan is the 2018 Fiesta Teen Queen. 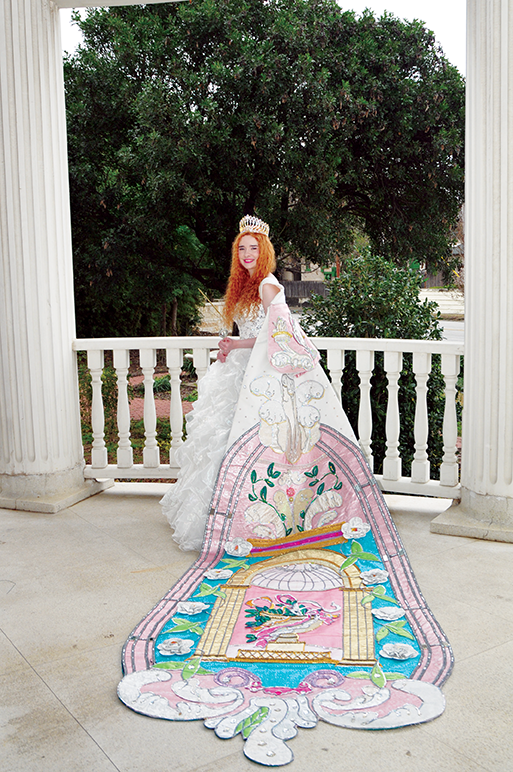 She has participated in the Woman’s Club of San Antonio Teen Queen Coronation since she was 5 years old. Kendall is an 18-year-old senior at Alamo Heights High School. Kendall is a proud member of the Osage Nation. She travels to the Osage and Kaw reservations in Oklahoma to read and distribute books to elementary aged children in after school programs there. Her program is called “Bark”, which is an acronym for “Books Are Really Keen”. Kendall has participated in the Duke University TIP program since the Seventh grade at Alamo Heights Junior School. It was during her Duke Summer course at Rice University that she discovered her love for Psychology and how it can be used to help people. Her ambition is to become a Psychologist and help people through animal therapy, a field which incorporates her love for animals with the joy she finds in helping others. Kendall’s Coronation will be on April 8, 2018 from 3:00 to 5:00 p.m. at the Jo Long Theater. Students from San Antonio Academy’s Robotics Program, “Team Infinity,” won ‘First Place Champions’ at the Alamo West Division Regional First Lego League Championship Tournament held on March 3. The team will advance to the World Championship on April 18 – 21 in Houston, Texas. San Antonio Academy was among 400 teams to compete in the Alamo Region this year. 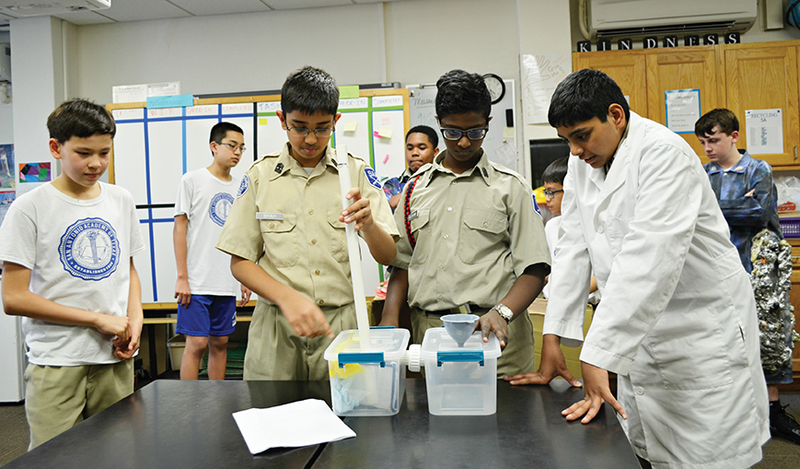 Team Infinity’s winning project involved the creation of a small grease trap for residential use. The idea came to fruition after attending a sponsored event by SAWS, SARA, and the Edward’s Aquifer Authority last fall, where SAA students were able to witness the life-cycle of our city’s water: how it is harvested, treated, transported back to the treatment facility and then re-treated for release of the effluent into streams. “After observing the process, our students spoke to SAWS technicians who spend every day unclogging and repairing our San Antonio drains. With some creative thought and innovation, they came up with a solution to possibly eliminate the problem caused by grease,” says Cathy Baumgardner, SAA’s Science Department Chair and Robotics Instructor. This is San Antonio Academy’s second time to win First Place Champion’s for the Alamo Region. SAA’s Robotics’ program is in its sixth year. First Lego League is comprised of elementary and middle school-aged students, who research a real-world engineering challenge, develop a solution, and compete with Lego-based robots of their own design. With adult Coaches to guide them, league teams (up to 10 members) apply science, engineering, and math concepts, plus a big dose of imagination, to develop solutions to real-world challenges.They also design, build, and program Lego Mindstorms based robots to perform autonomous “missions” on a playing field. Along the way, they develop critical thinking, team-building, and presentation skills. New to Alamo Heights ISD this year, the Heights Clothes Closet is stocked from floor to ceiling with gently used clothing for kids. The Clothes Closet supports district families who are struggling financially by providing year-round clothing to their children in grades Pre-K to 5th and their siblings. The Heights Clothes Closet was designed so that all three schools (Howard, Cambridge and Woodridge) work collaboratively by sharing resources, even fundraising, to support the needs of children. Children are referred by teachers, school counselors or parents. When children leave Howard, they are referred to their respective elementary schools. The goal is to support the child for as long as the family needs it. Currently the Closet is at Howard, Cambridge and Woodridge, with the hope of extending it to Alamo Heights Junior School and Alamo Heights High School next year. For more information, email HeightsClothesCloset@gmail.com. The Alamo Heights Independent School District Board of Trustees has announced that it has engaged the services of Horn Educational Consultants, led by John Horn and Jenny Preston, to facilitate the search for its next superintendent. Horn, a former superintendent in the Allen and Mesquite school districts, also serves as senior educational consultant with the Schlechty Center, one of the nation’s leading partners to schools in designing engaged learning experiences for students. Preston, a former superintendent in Allen, has been instrumental in launching the state’s Aspiring Superintendents Academy, which identifies and prepares future educational leaders across Texas. The pair has conducted more than 100 superintendent searches in Texas. Horn and Preston will initially advise the AHISD Board of Trustees in developing a profile for the district’s new superintendent. They will utilize various forums to gather feedback from the Alamo Heights community, district staff and school board, in an effort to create a profile that will allow the board to find the best candidate to fill the role of superintendent in Alamo Heights ISD. The superintendent search process, a customized, 90-120-day process, consists of multiple phases. In the initial phase, the consultants will research the preferred qualities of the superintendent, facilitating conversations through various forums with district staff, the community and school board. The ultimate goal is to have a new superintendent in place by July 1. 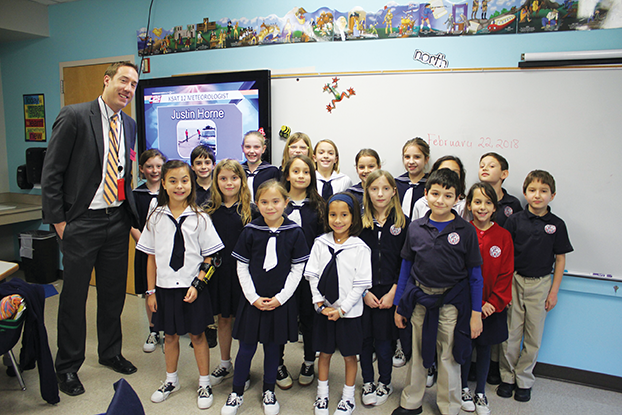 Third graders at St. Luke’s Episcopal School are studying weather and climate, with an emphasis on collecting, analyzing and interpreting data; such as precipitation amounts, wind speed and temperature changes. The study will culminate with each student giving a weather broadcast in the inkLab. They will cover cloud types, air masses and fronts, and extreme weather events as the unit unfolds. Saint Mary’s Hall (SMH) is known as an academic powerhouse. The school attracts, cultivates, and retains faculty who are experts in their subjects and their students. These experts average 19 years of teaching experience and nearly half hold advanced degrees. SMH faculty are often formally recognized for their accomplishments inside and outside of the classroom. Upper School Chemistry Teacher Justina Vidal won 1st place in the 24th Annual Science Education Awards, sponsored by the Texas Biomedical Forum. She was awarded the distinction at a ceremony held at The Argyle on March 7. Justina received $7,000 for her proposal, “Ocean Chemistry and the Effects of Carbon Dioxide Emissions on Ocean Wildlife.” Inspired by an interview she heard on National Public Radio (NPR) about the difficulties oyster farmers face as the ocean becomes more acidified, she aimed to educate her students on how the ocean acts as a sponge for carbon emissions and, thus, directly negatively affect the pH of brackish waters, the oyster industry, and surrounding ecosystems. Justina will have her students perform a project that will allow them to see a real world example of a synthesis reaction, Henry’s Law, Kinetic molecular theory, and the pH scale by recreating a miniature version of an oyster habitat in small aquariums in the classroom. Although new to SMH (teaching for two years), Justina has quickly made a difference in the students’ lives. 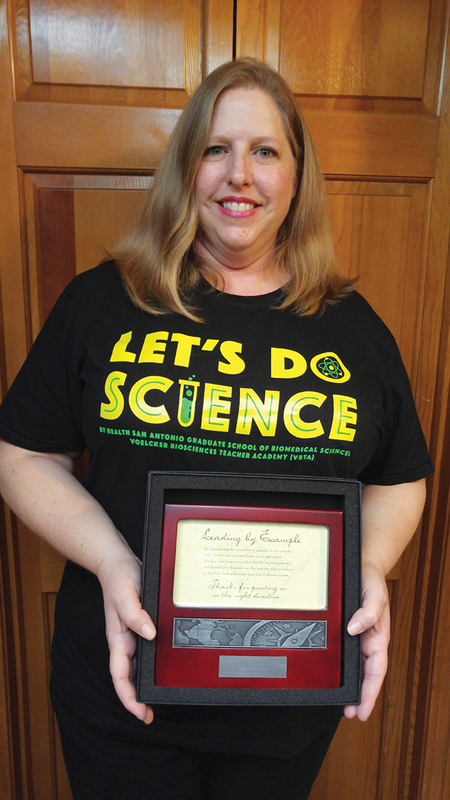 Lower School Science Teacher Jennifer Lee received the Voelcker Biosciences Teacher Academy (VBTA) Science Teacher of the Year Award on February 5. The mission of the Voelcker Biosciences Teacher Academy (VBTA) is to create a network of empowered educational professionals who work collaboratively to improve math, science, and health education. Jennifer was recognized for demonstrating in her everyday work the values of the VBTA, her leadership as part of the organization, and her ability to motivate others to perform their best. According to a statement by VBTA, she instills a sense of wonder and curiosity in her students though innovative and creative activities, such as using lemons to strengthen student observation skills and magnified parts of random objects to inspire students’ creative writing. Jennifer has helped shape young minds in the SMH Lower School for nearly 20 years. The University of the Incarnate Word is proud to announce its No. 9 ranking in the country on the list of the 2018 Top Military-Friendly Online Colleges, as well as the 2018 Top Yellow Ribbon Online Schools by SR Education Group, an online education research publisher founded in 2004. UIW is among 60 online colleges meeting the SR Education Group’s 2018 criteria for military-friendly online schools. These accredited schools provide strong military communities and support networks for their online students as well as exceptional financial assistance and flexibility. UIW is among the top 15 online schools to support an unlimited number of students and offer unlimited financial contributions through the Yellow Ribbon Program. The Yellow Ribbon Program allows colleges and universities to choose to support a certain number of veterans with tuition funds which the U.S. Department of Veterans Affairs then agrees to match. “The University of the Incarnate Word is honored to be recognized for excellence in online education by College Choice. With services and degree programs for busy adults, learner, the University is a proud member of the Yellow Ribbon program supporting active duty military service members and a vibrant Veteran community,” said Dr. Cyndi Wilson Porter, vice president, Extended Academic Programs. The SR Education Group used government data from the U.S. Department of Veterans Affairs GI Bill Comparison Tool to evaluate schools listed in their rankings. Over 500 schools were considered, and 60 made the 2018 Top Military-Friendly Online Schools. Each school on the list earned a military-friendly score of at least 65 points out of a possible 100. 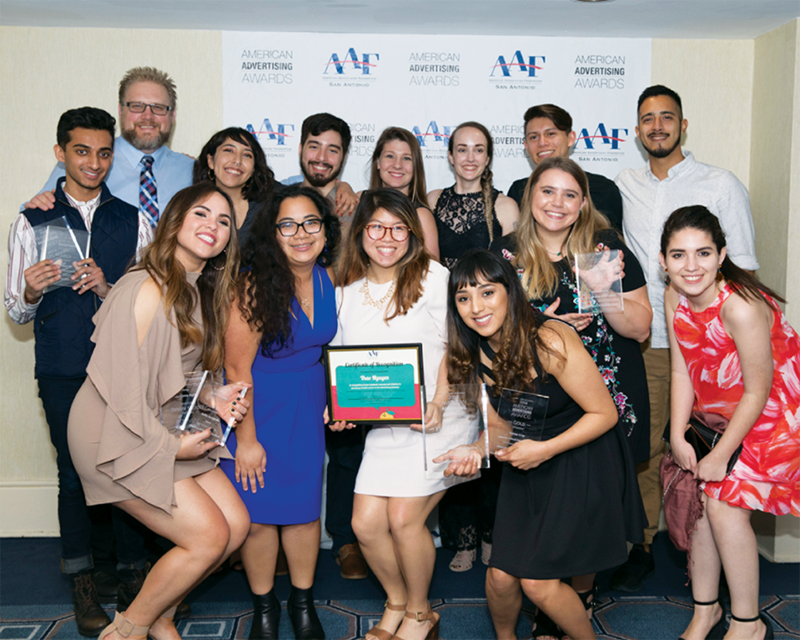 University of the Incarnate Word Graphic Design students stole the show at the 2018 ADDY® Awards hosted by the American Advertising Federation chapter on Saturday March 3 at the Sheraton Gunter Hotel. The students took home 15 of the 17 student awards, two American Advertising Federation San Antonio scholarships and the Best of Show Honor. At the ceremony the Gold, Silver, and Bronze Awards were presented with those winning Student Gold & Silver Awards advancing to the District 10 Competition. UIW students won 5 Gold, 3 Silver, 4 Bronze, and 2 Special Judges Awards as well as the Best of Show. UIW Graphic Design students competed against design students from San Antonio College, UTSA, the Art Institute of San Antonio and Texas State University. Two UIW students were awarded scholarships of $1500 and $500. The Best of Show winner claimed a $500 prize. 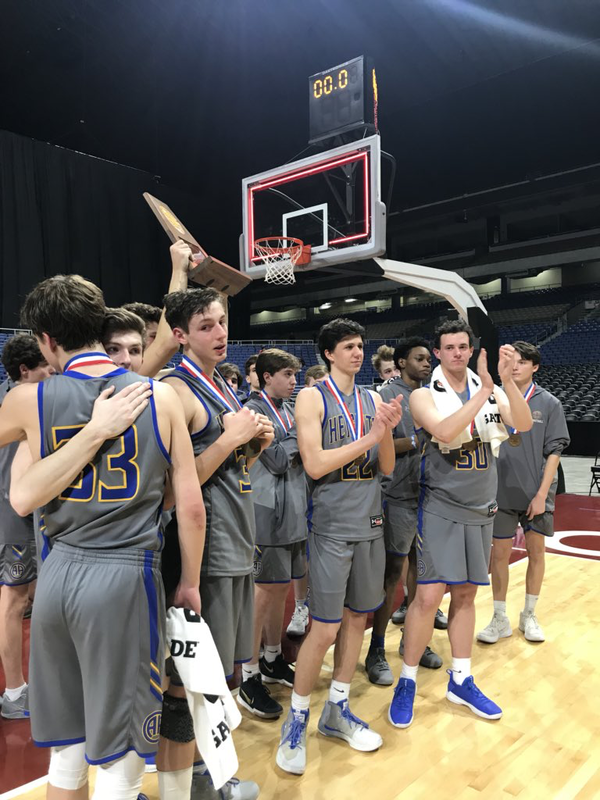 The Alamo Heights High School Boys Basketball team had an amazing season before falling in the State Final Four. Thanks to all the parent and student support for the great playoff run. Congratulations on a great season reaching the state Final Four falling to Justin-Northwest 65-54. Brandon Johnson lead the Mules with 20 pts. Congratulations to Evan Carcanagues for being named to the 5A – All-State Team. Evan was also named the District 26-5A MVP. District 1st team awards go to Brandon Johnson and Tyler Glover. 2nd team awards go to Matthew Pisano and Andrew Reichert, and Honorable Mention to Reed Sechler. The Alamo Heights High School JROTC team qualified for the National Leadership Bowl in Washington, DC, this summer. JROTC will have three trips to Nationals this year, including the Colorguard/Drill, Cyber Patriot, and Leadership teams. Kudos to the team heading to the Leadership Bowl as this is the first time JROTC has qualified. Team Captain: C/CPT Jana V. Hendricks, along with team members: C/1LT John P. Harrell, C/ SFC Gabrielle E. Woodward, and C/SGT Francesca G. Van Der Merwe, will be representing our AHHS Mules. Remember the old saying, Hip Hip Hooray? Well here’s to the Alamo Heights cheerleading team, who placed second in the 5A Division at the UIL competition. Varsity cheerleaders include Brooke Archer, Ansley Austin, Berkley Behnke, Ella Behnke, Faith Christianson, Chloe Collins, Sloane Davis, Abigayle DeLaGarza, Camille DeWees, Carly Fuhrmann, Audrey Garcia, Laura Gonzalez, Mikaela Goode, Erin Greehey, Sarah Hayne, Lauren Hicks, Maddie Hulse, Callie Jacob, Auburn Lucas, Annie Lynd, Ellie McGrath and Shelton Northington. Junior Varsity cheerleaders: Eva Anderson, Annie Bernstein, Crosby Beckel, Olivia Bianco, Kendall Cohoe, Kendall Johnson, Reagan Laine, Caroline Oliver and Emily Scott. Freshman cheerleaders: Carli Bordano, Parker Fernandez, Laura Fulton, Julia Gulley, Spencer Henderson, Lily Hobbs, Morgan Jackson, Brooke Kerby, Claudia Olson, Lexi Ramirez and Madison West. Caledonias: Campbell Woods and Brooken Cole. Of course, we can’t fail to mention head coach Ashley Johnson and trainers Amanda Boyd and Mike Post.